Some Hubstaff integrations allow for time entries to be posted directly to the site. What this means is that time tracked to tasks, tickets, issues, etc through Hubstaff is automatically synced with the third party site. However, this is not possible with all the integrations as not all of them support time entries. 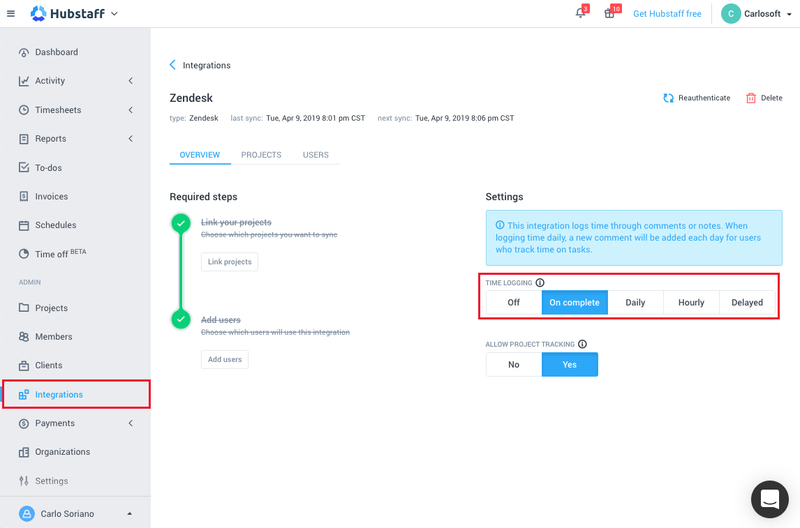 Keep in mind that in order to export time back to the third-party site first the end-user must connect the integration in their Hubstaff user account settings. Hourly – The time gets synced once an hour. Off– Will disable synchronizing task time for customers who really do not want it synced. (For customers who do not want the comments added to their tasks with the time information). Whenever anytime is synchronized to an external system (be it a task system like Asana, a payroll system like Quickbooks, our internal team payments) we mark it as synced to that system and it becomes immutable. We do this as we cannot easily reverse the time in the remote tool and customers want the time in the two systems to match up. If we were to allow you to unmark time as immutable then the time would end up being re-synchronized to the remote system and double-logging the time. Depending on the task system we either log the time as a comment or as native time entries (many of our other integrations support this). When Hubstaff records time to Redmine we use the default time entry activity. If a project disallows that activity from being used, then we can not log time to that project. Redmine does not support seconds in their time tracking API. So Hubstaff rounds the seconds. And this means any record that is less than 30 seconds does not get recorded in Redmine. Make sure that the time logging is enabled on Redmine. You can enable /disable for each project in the Modules section of the new project form, or the Settings tab of an existing project. In addition to logging time entries, the Hubstaff task writes back now supports closing or completing tasks directly through the app. 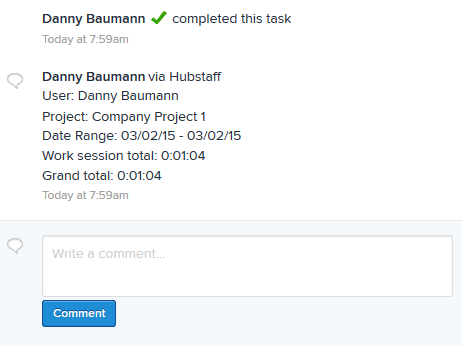 Your team will see a button that allows them to finish their assigned task (the language on the button will vary depending on what the project management service uses – examples are Close, Complete, Solve, etc). In order for this feature to work, the user must first connect their personal Hubstaff account with their account at the third party service. If they try to complete a task before doing this, they will receive a message letting them know. The message will also provide a link where they can authenticate their account. After connecting or re-authenticating, try completing the task from the Hubstaff application once more. The task will be completed and any time logged will be posted (assuming the site supports it). 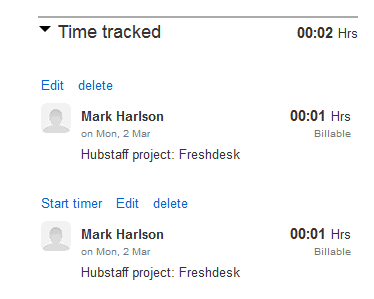 Tasks can be completed outside of Hubstaff in the project management tool to have the time synced as well.